Firefighters are ‘at the brink of exhaustion’ as an epidemic of arson attacks in Lurgan and Portadown push crews to the limit. A chief firefighter has warned that someone could die after the local stations dealt with more than 50 calls, most of them deliberate fires, within just a week. 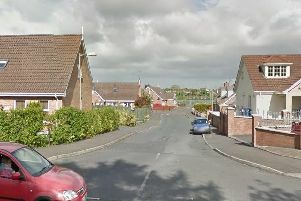 In the early hours of Tuesday morning alone, brave firefighters were tasked to three separate arson attacks, across Craigavon, within 45 minutes. One appliance was sent to a call at 12.16am at Central Way. There crews dealt with grass and bushes on fire. Minutes later as they were finishing the first fire, another call was made regarding a fire at Pinebank. A large gorse fire was ablaze and it took firefighters until nearly 1am to get it out. And at 12.58am another appliance was sent to deal with grass on fire at Highfield. “It is quite exhausting going from one fire to another and then to another. Our crews are heading towards exhaustion,” said Southern Area District Commander Victor Spence. To the arsonists he said: “You are putting lives at risk. Not just at these fires but they could be taking us away from a house fire or car crash. “And we are first responders if people suffer a heart attack. We might not be able to get there to help save a life. This is affecting people’s safety. “Luckily so far no one has been hurt but it is only a matter of time. “We are run off our feet at the minute. We are very stretched. It is very exhausting work. Dealing with these grass and gorse fires is very tiring,” he said. A recent statement by the NI Fire and Rescue Service revealed that Lurgan and Downpatrick were the two busiest stations over the past week as firefighters dealt with more than 500 fires across Northern Ireland. In Portadown crews dealt with nine gorse fires, four of them deliberate. Province wide since Monday, May 1, to Sunday, May 8, NIFRS has attended 511 gorse fires of which 466 were started deliberately. District Commander Spence said dealing with these types of incidents puts not only firefighters’ lives at risk but the lives of everyone in the local community and puts additional pressure on operational resources. “We are appealing to everyone within the community to remain vigilant when in the countryside. “If you see a fire report it immediately to the Fire & Rescue Service. Don’t attempt to tackle fires and leave the area as soon as possible. “Deliberate fire setting has major consequences - it ties up our vital resources from other more serious incidents and potentially puts people and property at risk. “These fires can easily spread and even a slight change in wind direction can pose a serious risk to life, property and the environment. If anyone has any information in relation to fire setting we would urge them to contact the PSNI.